Custom promise ring- perfect four couples to wear before an engagement to symbolize love and devotion. Personalize with your name, date or short phrase and make a promise of commitment today. Sterling silver stackable ring set. 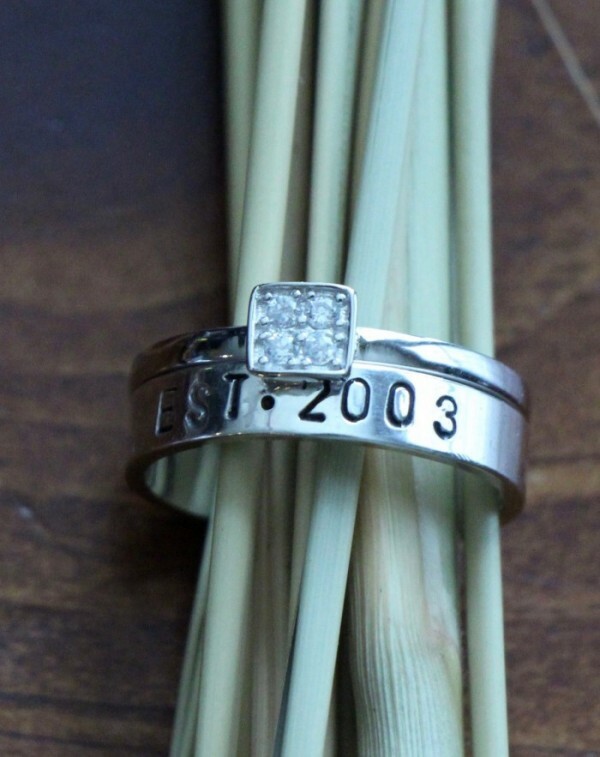 Personalized, hand stamped ring measures 4mm. Personalize with up to 12 characters- heart stamp available between names or end of phrase. Available in sizes: 5, 6, 7, 8, 9. Categories: Anniversary, Collections, Couples Jewelry, Hand Stamped Rings, Holiday Gift Ideas, Message Rings, new, Stackable Rings. A heart stamp looks great between names or at the end of a phrase. *Enter “(heart)” to include a heart in your personalization in the order you would like it stamped.